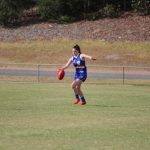 GEELONG and Northern Territory (NT) Thunder continued their dominance in round six, keeping their undefeated streaks alive. The Bulldogs also registered their first win in the Victorian Football League (VFL) Women’s competition this year after welcoming back a host of AFL Women’s players. NT dominated from start to finish, keeping the Blues to one goal in the opening half of footy. Carlton struggled to compete with the defensive pressure applied by the Thunder players, who were solid down back and stopped any forward momentum sparked by the Blues. Up the other end, NT hit the scoreboard with ease. Jessica Sedunary was in ominous form up forward for NT, slotting three goals for the match and competing hard to win the footy. Teammate, Jenna McCormick was also impressive imposing herself on the contest and hitting the packs hard. 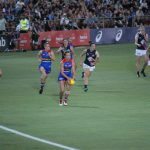 AFLW star, Chelsea Randall continued her consistent ways while Adelaide teammate, Courtney Cramey starred with 17 disposals showcasing her class around the stoppages on debut for NT. For the Blues the likes of Sophie Li and Caroline Hardeman stood out in a disappointing outing, gathering plenty of touches and working hard across the ground. Li lead the way for disposals, amassing 19 possessions credit to her ability to find the footy and use it efficiently. Jess Hosking was also influential for Carlton, hitting the packs hard and winning plenty of the footy, gathering 16 possessions for the game. The Western Bulldogs put on a masterclass at Henry Turner Memorial Reserve, keeping the Seagulls to four goals for the game and piling on a whopping 12 themselves. Their dominant start held them in good stead for the game, as they applied plenty of physical pressure. Williamstown struggled to control the goal fest, letting the Dogs run rampant in their forward 50. For the Bulldogs, Alyssa Mifsud was an absolute star up forward, bagging five goals. She looked dangerous all game and found herself in damaging positions, credit to her ability to lead up at the footy and take strong marks. The other goal-scoring machine for the Dogs was Jessica Francke who slotted four goals for the game. Libby Birch and Hayley Wildes also impressed with their ability to win the footy and impact the contest. Down the other end, Williamstown midfielder, Jess Duffin was one of the best afield, scoring an important goal and gathering plenty of touches. She competed hard all game and was aided by teammate Jenna Bruton who was influential across the ground. Jasmine Garner and Georgia Harris were key players for the Seagulls, scoring a goal apiece and applying good physical pressure on their opponents. The Cats kept their winning streak intact when they defeated the in-form Darebin Falcons. Geelong led for the whole game, but the Falcons won the last quarter as they scored all their goals in that period. Mia-Rae Clifford scored half her team’s goals in a brilliant display. The Cats star also notched up 20 disposals and seven tackles in a great all-round performance. She was complemented by new Geelong AFLW recruit, Richelle Cranston, who was flawless in her 26-disposal, five-mark performance. Her tackling was also ferocious, as she laid six of them. Former Carlton midfielder, Madeline Keryk impressed in her debut in the blue and white hoops, kicking a goal and notching up 14 disposals. AFLW duo, Nat Exon and Lily Mithen were the leading disposal-getters for Darebin, with 22 and 21 respectively. But a gallant performance from Stephanie Simpson nearly won the Falcons the game. Simpson kicked all of her team’s goals, booting two last quarter goals. She also laid five tackles in a solid performance. This match was headlined by a lovely tribute to the passing of Eurydice Dixon, as the players stood arm in arm to pay tribute to the comedian. In terms of the game, the Hawks held the high-flying Saints goalless at half-time, going on to win by 33 points. Emily Gilder had an impressive day out in the forward line, kicking two majors for the Hawks. She was complemented by former Collingwood AFLW defender, Meg Hutchins and Adelaide AFLW forward, Sarah Perkins, who also got a major on the board. Hutchins’ former AFLW teammate, Melissa Kuys was deemed best-on-ground by her coaches in her return to the Hawthorn line-up. Despite having their first AFLW signing, Lauren Arnell in the side, the Southern Saints couldn’t get the job done on Sunday. But captain, Georgia Walker led the way for her side in a tough day out at Box Hill. 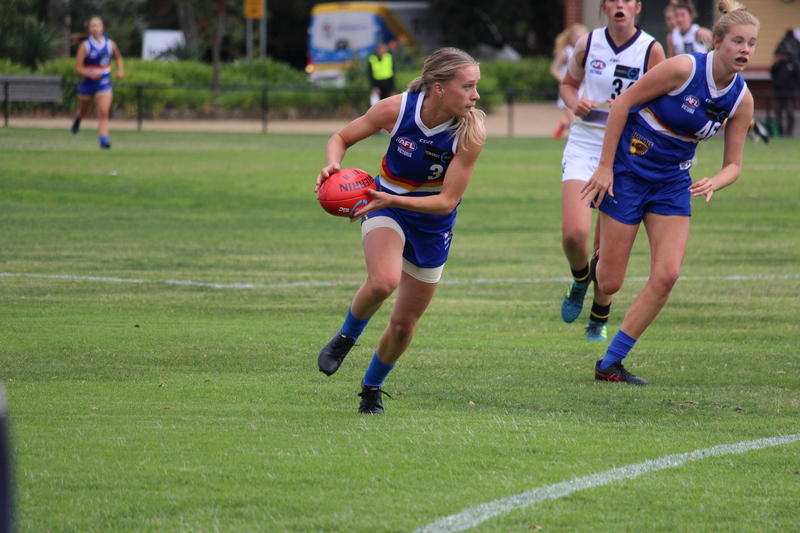 Kate Macqueen was the side’s solitary goal-scorer while Eastern Ranges recruit, Ashleigh Allsopp had an impressive performance in her VFLW debut. The Tigers applied plenty of defensive pressure at Queen Elizabeth Oval, keeping Melbourne University to a mere two goals for the whole game. In difficult wet and windy conditions, Richmond continued its winning ways with another four-quarter performance. Meanwhile Melbourne University struggled to compete with the intensity and class of the Tigers who seemed to dominate across the board. Up forward for the yellow and black, the likes of Jess Gardner and Jenna Colwell stood tall, bagging important goals given the wet weather. New GWS recruit, Christina Bernardi was one of the best for the Tigers, showcasing her ability to win the footy at the coalface and use the footy well no matter the conditions. Teammates, Louise Stephenson and Lisa Davie were also influential across the ground, displaying their ability to create a contest and use the ball effectively. 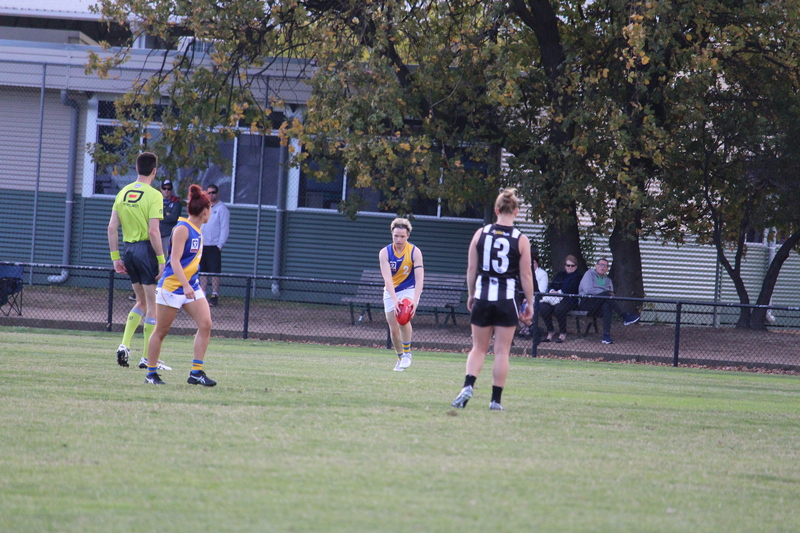 For Melbourne University, Kaitlyn Ashmore worked tirelessly all game and slotted one of the two goals for her side. The likes of Prudence Cordes and Jasmine Grierson also starred in difficult conditions, using the ball well and hitting targets when it counted. Katherine Gillespie-Jones was another key player for Melbourne Uni, hitting the packs hard and gathering plenty of touches. 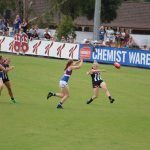 THE Victorian Football League (VFL) Women’s season rolls along into round four with a number of huge games throughout the weekend. The Hawks enjoy the bye after a huge win over Carlton, helping further establish them as league leaders. The Thunder, Cats and Pies all look to build on impressive starts, while the Bombers and Seagulls desperately try to notch up their first wins. 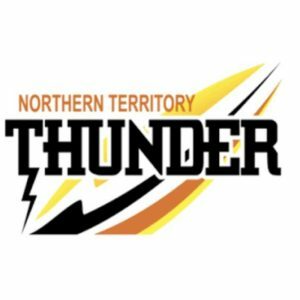 The NT Thunder sent another huge message last week in its demolition of the Bombers, moving to 2-0 for the season with both wins being dominant. Terrific performances from captain, Angela Foley with 28 possessions and two goals, alongside Emma Swanson, who also added two goals herself, contributed to the big win in Darwin. The Thunder look to continue its unbelievable run against a rested and ready Melbourne Uni, who is fresh off the bye. The Mugars will need a huge game from AFLW MVP winner and North Melbourne recruit, Emma Kearney through the middle of the ground if they wish to stop the prolific offence of the Thunder and improve on their 1-1 beginning to the season. The Demons come off a disappointing loss to the Saints last week, where poor goal kicking, along with a poor last quarter ultimately did them in. Despite the loss, Casey was impressive throughout the game and showed great signs without getting the four points. Former Bendigo Pioneer, Eden Zanker was particularly impressive as she works to continue developing throughout the competition. AFLW teammate, Kate Hore also had a terrific game in her own right. 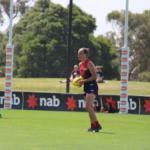 Big performances from these two could help the Demons to get back on track. The Falcons on the other hand come off a bye and will look to establish dominance early on after having two weeks of preparation. Hannah Mouncey will look to continue her spectacular start to the season, building off her three-goal effort in the Falcons’ last encounter. Collingwood is looking to continue their great run of form in round four in a clash against the Western Bulldogs. Undefeated from their three games (two wins, one draw), the Magpies have built quite the impressive squad to begin the season. 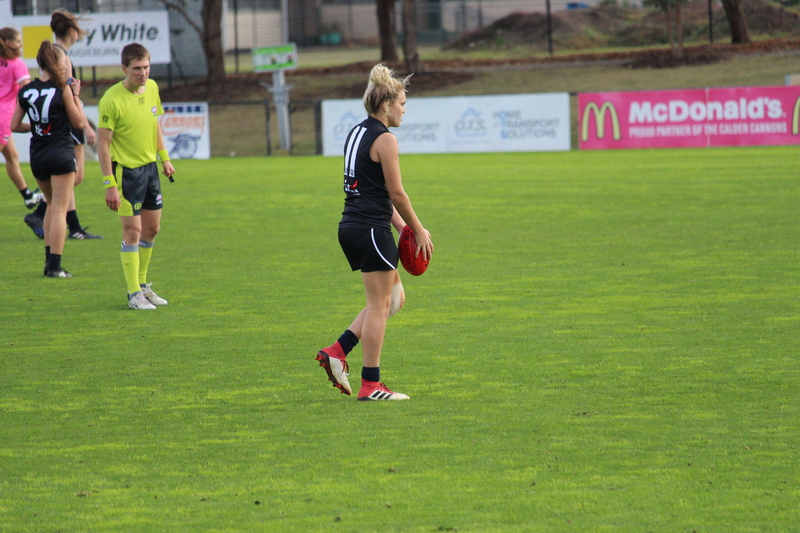 Jaimee Lambert found form last week in a two goal, 24 possession effort to lead the Pies to a comfortable win. This came alongside another impressive performance from former Calder Cannon, Sarah Dargan, who continues to grow in leaps and bounds. The Bulldogs come into the contest in desperate need of a win to get their season going, having lost their first two encounters, and rested with a bye last week. Hayley Wildes has been off to a great start in the opening two games for the Bulldogs, tallying up a high amount of possessions and using the ball extremely well. They will need another great game from Wildes, as well as a step up overall from the team at large if they wish to notch up their first win. The Cats come into round four in a great run of form, having smashed Williamstown by 53 points last week. A terrific effort saw the Cats hold Williamstown to just four behinds for the entire game, with relentless effort down in defence, led by their captain, Rebecca Goring, who was spectacular. The emergence of NT recruit, Evelyn Dhamarrandji in round three just added to Geelong’s dominance in the competition so far. The supporting cast such as Richelle Cranston have also stepped up and been great for the Cats in the first three weeks and will be pivotal again against a Carlton side who also find themselves in good form. Despite a loss to the Hawks last week, the Blues still come in with a great deal of hope against Geelong. Last week was a classic ‘’burn the tape’’ game for the Blues as they were beaten in all areas by a determined Hawthorn side who were firing on all cylinders. If the Blues are able to find their form from the first two games with players such as Darcy Vescio, Jess Hosking and Lauren Arnell continuing their good stretch, it will go a long way towards getting a rebound win. The Saints fought their way to a well-earned victory last week, placing them at 2-1 heading into their clash against the bottom of the ladder Bombers. Alison Drennan continued her fantastic start to the season with another great outing of 22 possessions and a goal, and was instrumental in the Saints fourth quarter run to get them over the line in a close finish. Four goals in the final term showcased the Saints’ firepower, which they will look to put to great use in overwhelming an Essendon defence which has given up big scores throughout the early rounds. Essendon enter the round winless and are in desperate need of a big game to kick-start their season. For this to happen, they must put together a full four-quarter effort, something that has eluded them thus far. After being held scoreless from quarter time onwards last week, they will be looking to take control early and maintain that pressure to the end this time. What a difference two weeks makes! After a terrific outing in round one, the Tigers come in off the back of two blowout losses and will look to get back on track against the equally struggling Williamstown. The Tigers had a strong performance last week from Jacqueline Graham in defence but struggled to get any other meaningful contributions down back, which resulted in an overall poor performance. With just two goals in the last two weeks the Tigers will also be looking for better results from the forwards. 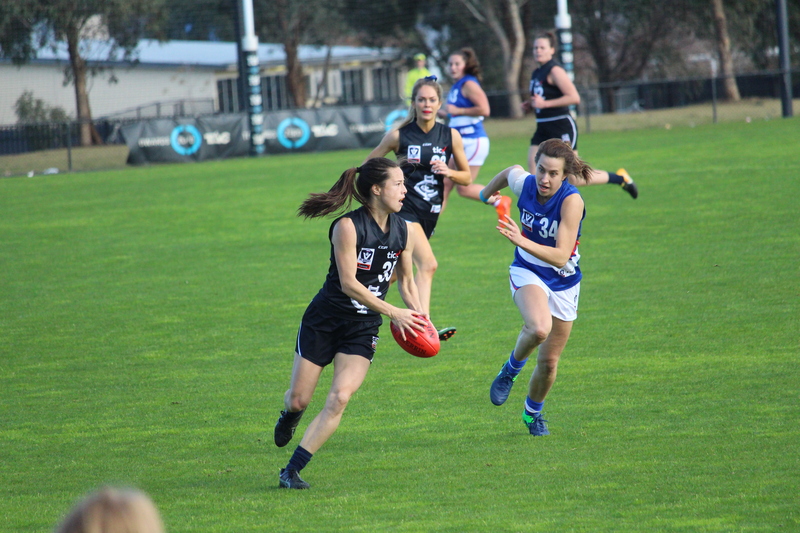 A four goal game from co vice-captain, Kate Dixon propelled them to victory in round one and a similar effort from her or another Tigers player would go a long way towards a win. Williamstown, similar to Essendon find themselves winless from three games and will be doing everything they can to avoid going 0-4. An incredibly disappointing performance last week saw them fall to the Cats by nine goals, with them being dominated in all areas. Jess Duffin, however continues to be a shining light for the team, despite their poor performance overall. A better team effort could do wonders for the Seagulls and potentially yield their first win. AS the Victorian Football League (VFL) Women’s competition begins to take shape, we see a number of intriguing encounters in round three. The round kicks off with the battle of the unbeaten teams, as the Hawks take on the Blues in Box Hill and culminates with the classic Richmond and Collingwood rivalry down at Punt Road. The Darebin Falcons, Western Bulldogs and Melbourne Uni Football Club all enjoy byes this week. The Hawks look to continue their impressive start to the season when they take on the Blues in a Saturday morning clash at home. After a decisive victory over the Bombers in round one, the Hawks were able to grind out a tough seven-point win over Casey to improve to 2-0 for the season. Sarah Perkins has looked dangerous up forward to begin the season, booting three goals and creating a number of scoring opportunities for herself and her teammates. The Hawks welcome back Melissa Kuys in defence after she missed the game against Casey, however the side will be without fellow defender Pepa Randall. Carlton is also coming off two terrific performances in the first two rounds, with comprehensive wins over the Saints and the Bulldogs. The Blues hit the scoreboard with ease the past week led by Jess Hosking, Kimberley Cunico and Kate Shierlaw’s two goals each. Expect a tight contest as two of the early season contenders go head-to-head. The Saints bounced back in a big way last week, recording a 30-point win over Williamstown, and will look to build off of that performance with another strong outing against the Casey Demons, who are winless from their only outing. Danielle Lawrence was a force to be reckoned with last week as she absolutely tore the Seagulls apart, kicking four goals, and was complemented by Alison Drennan who had another outstanding performance with 35 disposals and a goal. Casey produced a strong performance against Box Hill last week, before ultimately running out of legs in the last quarter as the Hawks ran over the top of them en route to victory. The Demons will look to put together a full four-quarter effort and notch up win number one of their VFLW season. Their defence was key in their contest last week, led by Katherine Smith, and they will need another strong performance from her and her fellow defenders in order to shut down the prolific Saints, who kicked nine goals in their victory last week. The Thunder come into their round three clash fresh off the bye, while the Bombers come off another disappointing encounter, having lost to Melbourne Uni. The Thunder absolutely destroyed the Darebin Falcons in the opening round to the tune of a 54 points and were dominant in all facets of the game. Led by AFLW stars Chelsea Randall and Emma Swanson who each got plenty of the footy with 23 disposals and 31 disposals respectively, as well as a dominant performance from Marijana Rajcic who kicked three goals and four behinds from her 25 possessions up forward. Essendon on the other hand are in desperate need of a win, having dropped its first two encounters. The Bombers were good in patches last week, holding a half-time lead over Melbourne Uni, and were in the game right until the end before succumbing to an eight-point defeat. Captain, Lisa Williams led from the front and will look to put in another strong game and lead the Bombers to their inaugural VFLW win. The Cats were a part of history last week as they played out the first ever VFLW draw against the Pies, while Williamstown fell for the second straight week. Renee Garing led the way through the middle of the ground with 30 possessions, with new recruit Richelle Cranston also turning in an impressive performance. Their side faces a desperate Williamstown team who look to announce themselves in the competition by getting their first win on the board. Despite the loss last week, Jess Duffin was a standout with three goals from her 20 possessions to help keep the Seagulls within striking distance. Williamstown will be hoping that the changes made at the selection table will inspire a new sense of belief into the players, with several inclusions into the side. Two traditional rival clubs go head-to-head on Sunday afternoon down at Punt Road Oval. The Tigers were unbelievable in round one, holding the Western Bulldogs goalless in a 38-point victory. However, they were on the other side of a goalless affair last week with an almost identical scoreline, this time resulting in a 39-point loss which saw them held to only four behinds. They look to get back on the winners list against an impressive Collingwood side, who come in with a win and draw to their name. Despite being the better team for the majority of the game last Sunday, the Pies’ bad kicking ultimately did them in, resulting in the competition’s first draw. Jaimee Lambert was terrific last week, alongside Sarah D’Arcy, who really put their impact on the game early. Young gun, Sarah Dargan also continues to develop nicely as she turned in an impressive 21-possession game in a breakout performance. ROUND two of the Victorian Football League (VFL) Women’s gave the football world a more clear picture of where each team sits. Richmond has crashed back down to earth after being smashed by Darebin on Saturday. After their win, the Falcons showed that they cannot be ruled out after their mammoth loss to NT in round one. The Hawks also stamped themselves as contenders with their second straight win. Darebin dominated Richmond, and the Team of the Week with three players getting a spot in the best 22, headlined by Hannah Mouncey who was dominant up forward with three goals. Melbourne University also had three players, including new North Melbourne recruit, Emma Kearney who finished with 25 disposals. The Southern Saints got some love this week after their first win in the competition, with Danielle Lawrence (four goals) and Alison Drennan (35 disposals) making their way into the best 22. With so many standout midfielders this week, it was too hard to fit Carlton’s Sophie Li and Collingwood’s Sarah Dargan into the Team of the Week, but they should still be commended for wonderful performances.